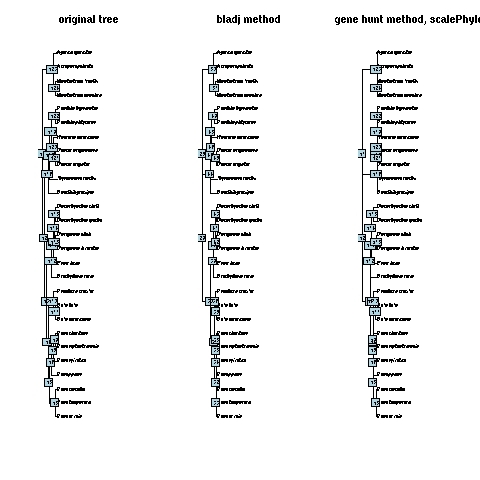 Here is an approach for comparing two methods of adjusting branch lengths on trees: bladj in the program Phylocom and a fxn written by Gene Hunt at the Smithsonian. Gene Hunt’s method has many options you can mess with, including setting tip ages (not available in bladj), setting node ages, and minimum branch length imposed. You will notice that Gene’s method may be not the appropriate if you only have extant taxa. The function AdjBrLens uses as input a newick tree file and a text file of node ages, and uses functions you can simply run by “source” the R file bladjing_twomethods.R file from here. Note that blad does not like numbers for node names, so you have to put a character in front of a number of just character names for nodes. It is sort of hard to see the differences in the branch length changes here, but the individual output trees will reveal the differences better.